Wolfe® LED Cordless Educational Microscopes is rated 5.0 out of 5 by 1. Grades 7–12. Pack up one of these cordless, portable microscopes and take it anywhere you have something needing a closer look. With an inclined 360° rotatable head, in-stage condenser, in-base illuminator, and iris diaphragm, each is ready for the most demanding student laboratories—whether inside or outside. Grades 7–12. Pack up one of these cordless, portable microscopes and take it anywhere you have something needing a closer look. With an inclined 360° rotatable head, in-stage condenser, in-base illuminator, and iris diaphragm, each is ready for the most demanding student laboratories—whether inside or outside. 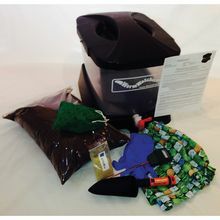 The included AC adapter/charger can power the microscope from a standard electrical outlet, or charge the internal nickel-metal hydride batteries for up to 60 hr of cordless use per charge. The LED Cordless Educational Microscope with Mechanical Stage (item #590972) has all the basic features, plus a built-in mechanical stage with low-position coaxial controls. The LED Cordless Advanced Educational Microscope with Mechanical Stage (item #590973) has all the basic features, plus a spring-loaded 100x oil-immersion lens, quadruple nosepiece, Abbe condenser, and built-in mechanical stage. 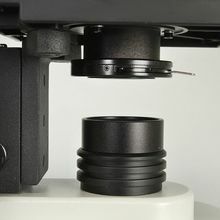 The LED Cordless Educational Microscope with C-Mount Adapter (item #590975) has all the basic features, plus a monocular head with C-mount adapter, a quadruple nosepiece, an Abbe condenser, and a built-in mechanical stage with low-position coaxial controls. Size, 14" H x 5" W x 6-1/2" D; wt, about 7 lb. 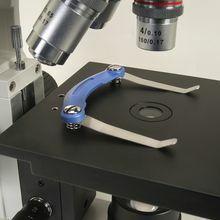 Rated 5 out of 5 by ScienceGuy from Nicely Made This is a very nicely made, high quality microscope for the price. Will definitely buy more.